At Penn Med, “mentorship” is more than just a buzzword. An MS3 shares her perspective on the culture and community of mentoring at Penn. When I think back to May 13th 2013, less than 48 hours before the equally exciting and fearful May 15th deadline (aka the day which “you must pick one, and ONLY one medical school to attend,”) I am pleasantly reminded as to why I chose to attend medical school at the University of Pennsylvania. I think back to that afternoon where I found myself sitting at my kitchen table with my older brother, who is also a physician. I was making the painstaking decision between attending medical school close to the comforts of home, family, and friends at my alma mater or moving to the East Coast in order to attend the Perelman School of Medicine at the University of Pennsylvania. While my brother knew months prior when I was accepted to UPenn that I would be matriculating here for medical school, he sat patiently while I resorted to my handy-dandy “T-diagrams” and allowed them to fulfill their timeless role as a “pros and cons” list, one for each school. About half way through my first list, my brother appropriately nudged me along in my decision making. He simply asked, “Liz, what is holding you back from admitting that you belong at Penn? The hard part is over… they’ve already accepted you! Now all that you have to do is GO!” While even he had to smirk at his over simplification of my just having to “go” to the East Coast, my response was more insightful than expected. I replied with the honest answer that I was hesitating out of fear—I would be moving to a new city where I had no family, no friends, and would unfortunately have to face my fear of flying at least twice a year! I expressed that what I needed was to have someone like him, like family, at Penn. Someone to have my best interests in mind and, of course, tons of patience and encouragement for all of my sure-to-come struggles. He took my list and added “mentorship” to the “pro” section for UPenn. Sibling rivalry usually limits my acknowledgment of how smart my brother may be, but I have to admit, he sure knew what he was talking about this time. While the concept of mentorship may not be unique to UPenn, I do believe that it is uniquely applied here. At every level of the “medical school hierarchy” connections are constantly being made, upheld, and expanded upon, whether that be between medical students in the same year, different years, with residents, attendings, post-docs, etc. To be honest, though the term “hierarchy” certainly serves a historical and legal purpose within the medical community when distinguishing student from resident from attending, it just doesn’t feel correct to apply to Penn. If I had to describe the relationship of academics at Penn Med, it would be best described as a ‘web’ comprised of multiple layers of closely interwoven thread, all of which rely on connections with others to maintain its tension and strength. The building of your “Penn web” begins during your first week of orientation when you are assigned to your “learning team”, a random grouping of 6-7 students with whom you share the most time during your first year and a half of med school While taking ‘team exams’, synergizing in small groups, and taking classes together, whether or not you realize it at the time, you are also mentoring one another. With the beyond impressive students at Penn, and their incredible variety of backgrounds and experiences, it really should have come as no surprise that my classmates have offered me some of my best mentor and mentee interactions, an asset that cannot be highlighted enough as clerkships are now off and running! In addition to the supportive infrastructure Penn Med students offer one another, the impressive faculty are a key distinguishing feature at Penn. In all honesty, this exact paragraph was written after a prolonged period of writer’s blocker encouraged me to check my inbox, and I had three emails, from three different mentors, currently in three different states, still taking the time out of their busy schedules to respond to emails and offer advice or project ideas. I have never felt so supported as a student, future physician, but most importantly, as a person by this university. With time built in to our curriculum for a scholarly pursuit, we are constantly encouraged to interact with our faculty and peers. Often meetings which begin with discussions about research projects conclude with encouragement, guidance, and most importantly, a sense of genuine support as we trudge forward in our careers. I may not know exactly what field of medicine I will end up in or where I will be practicing, but I am confident that UPenn has and will continue to provide my classmates and me with the necessary tools to pursue and accomplish our goals. Elizabeth Messenger is a 3rd year medical student at the Perelman School of a Medicine. She is currently interested in pursuing a career within dermatology. In her free time, you can find her on the volleyball or basketball courts. Penn Med Voices took a (much needed) hiatus this summer. Now we’re back, with many more stories to share! 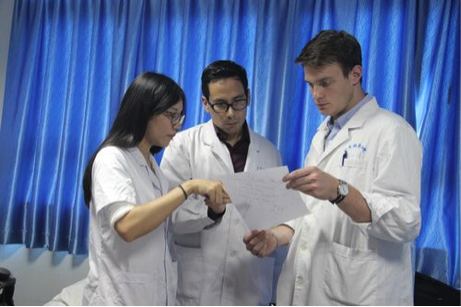 First up, Christopher Magoon, an MS2, writes about his summer doing ophthalmology research in China. I came to China to work with Nathan Congdon, MD, MPH, a professor of Preventative Ophthalmology at ZOC and a leading researcher in blindness prevention in the region whose work has been by featured in NPR, The Wall Street Journal, and Chinese State Television, among others. With funding from Penn’s Global Health Program, I spent nearly two months living in Guangzhou, working with Dr. Congdon and his team. 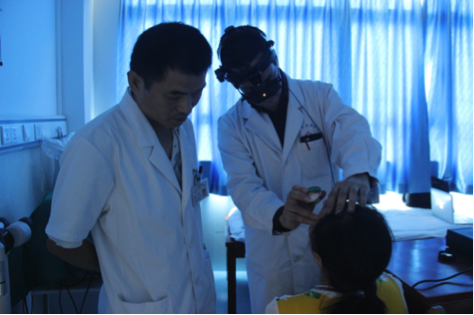 Like many in China, Dr. Congdon’s team works doggedly to keep up with a country that is changing at breakneck speeds. China’s stunning rise in wealth, urbanization, and technological prowess has yielded rises in obesity, income disparity, and more health care demand. This produces a public health situation that is, frankly, difficult to grapple with. Broadly speaking, Dr. Congdon’s team conducts research to understand how and why barriers to care exist, and what various stakeholders can do about it. Within this swirling landscape, it is easy to underestimate what is at stake. China has seen unparalleled progress in many categories of health metrics, yet the gains still hang in the balance. China’s population is aging rapidly, and as a result of the one-child policy, many Chinese will have to bear the costs of both parents’ healthcare needs without the support of siblings. As China has developed, it has seen a concordant rise in diseases that are familiar to more affluent settings: diabetes, cardiovascular disease, and obesity. These chronic diseases are costly and time consuming to manage. Perhaps of greatest concern, China’s income disparity has yielded a massive number of people who are feeling left behind and angry, with few formal avenues for recourse. This anger often spills over into the hospital wards, as patient attacks, and even murder of doctors, is commonplace across the country. In 2012, Chinese hospitals averaged 27 attacks per hospital per year. Most of my days were spent in our modest office on the 4th floor above a mall that sold household appliances; like many organizations in China, ZOC has outgrown their main building. I shared the office with statisticians, residents, physicians, postdocs, fundus readers, IT experts, and others who formed our team. There are many projects going on at once, and I pitched in where I could: editing documents, translating from Mandarin into English, and working on a review article of interventions for non-communicable diseases in low- and middle-income countries. When not in the office, I studied Chinese. Though I’ve spent years learning the language, there is always more to know, especially focusing on medical vocabulary and 汉子, the written characters. In many ways, studying Chinese is similar to being a medical student—the more you learn, the more you realize how far you have to go, while still creating amazing opportunities. Coming back to Philly to begin my second year of medical school, I feel lucky to have been able to experience this different system, with its unique set of challenges and solutions. Yet I am reminded of the fact that our own system suffers from parallel ailments: inequality, chronic diseases, and increasing costs. On both sides of the Pacific, there are no easy answers—but ample reason to ask precise questions. Christopher Magoon is a second year medical student who lived in rural China from 2011-2012 working for a rural education non-profit, after graduating from Yale University with a history degree. In his spare time Chris enjoys learning medical Mandarin, building tables, playing squash with his learning team buddies, and being an all-around cool dude. Penn Med offers a wealth of research opportunities and experiences, but finding a research project can seem overwhelming at times. MS1 Andrew Becker shares his perspective. In an upcoming post, an MS4 will be sharing her experience getting involved in research during medical school. The classmate, unaware he is about to change the world, hears “PI” and doesn’t ask for clarification. He says goodbye to Esther, and starts towards the gym. Midway through his workout, somewhere in the Fox Fitness center, it hits him. He could not have realized the magnitude of what he said. In that moment, PI entered the mainstream of acronyms med students will forever use. I came into Penn Med with “PI” so burned into my vernacular that it ached. However, I learned quickly there is no rush to find one. The search does not start until the end of the first semester, at the very earliest (talking from the MD track perspective here). Most first year students start looking in the spring semester if they so choose. After some quick reply emails and a bit of scheduling, I set up a few informal meetings. I knew I loved surgery, but what type? Might as well have asked me what my favorite type of grilled cheese was… there’s no such thing as a bad grilled cheese. I had the opportunity to sit down with physicians in departments from Transplant to Trauma Surgery. We talked about career paths, life as a surgeon, and the place for medical students to help. I joined a Trauma Surgeon running simulation exercises for nurses at the new Presbyterian Hospital trauma bay. The project sounded engaging and the commitment during the semester was minimal. Further, I decided not to stay and do research this upcoming summer; instead opting to do some traveling. All these questions were answered through some quick conversations and short emails with engaged doctors. The word PI will be different for everyone. To some, their Playful Irish Setter will fill their lives with hard work and endless generosity. To others, their Purple Iguana will be what helps them decide their future career. To most, their Pricey iPhone case will be around for a short time until they find their own path in medicine (or decide to make their own to sell on Etsy). Many students may opt for none of the above, instead finding other commitments just as important. The point being this, Penn Med is wonderful in that it fully recognizes the breadth of medical student interests. Whatever type of PI you are looking for, you can find it here at Penn. Just be careful about using that acronym at the pet store, you may just find yourself with a new Playful Irish Setter resting on your couch while you play Angry Birds after a day of research. Andrew is a 1st year medical student at Penn planning to take a year out for his MPH. He graduated from Ithaca College majoring in Biochemistry and Sociology. Andrew is interested in surgery, running, grilled cheese and hipster coffee.